Knopf Books for Young Readers, 9781524716158, 32pp. A modern, summery spin on the classic The House That Jack Built, in which Lola's day at the beach leads to new friends and a giant sandcastle. Lola is building her dream sandcastle--one with a tall, tall tower and sea glass that sends signals to mermaids. But the beach is crowded, and soon enough, a boy steps on her castle. Not to worry! Lola recruits him to build a wall. When a toddler with a bulldozer starts digging too close the walls, Lola decides he can be in charge of digging the moat. As the sandcastle grows, so does Lola's friendly group of helpers. There's only one thing that Lola doesn't want near the sandcastle: a wave! Will the new friends be able to salvage the mermaids' castle when their hard work is washed away? 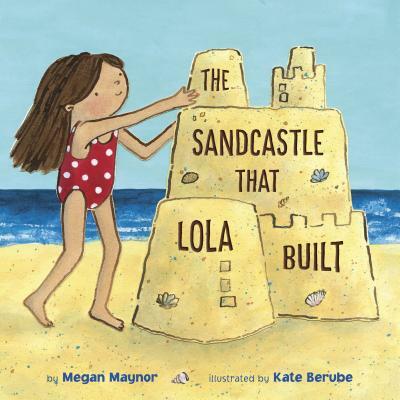 The sandcastles that Megan Maynor built were mostly on lakeshores, because she is a Minnesota girl herself. These days, she mostly builds stories to share with children. Megan is also the author of Ella and Penguin Stick Together and Ella and Penguin, A Perfect Match. She lives outside Minneapolis with one husband, three kids, and one rabbit. Learn more about Megan and her work at MeganMaynor.com or on Twitter at @Megan_Maynor. Kate Berube (Bear uh bee) has spent many hours building sandcastles and searching for mermaids on the beaches of Cape Cod and the Oregon coast. Kate is also the illustrator of My Little Half-Moon and The Summer Nick Taught His Cats to Read and the author and illustrator of Hannah and Sugar, which won the 2017 Literary Arts Oregon Book Award. She lives in Portland, Oregon, with her husband and their one-eyed wonder dog, Sugar. Learn more about Kate and her work at KateBerube.com and on Twitter at @BerubeKate.